Veteran Ketchum law enforcement officer David R. Kassner has been selected as the city’s new police chief. Kassner’s appointment was announced Tuesday by the Blaine County Sheriff’s Office, which has a contract to provide police services for the city of Ketchum. Sheriff Gene Ramsey said the appointment became effective on Tuesday. Kassner has served with the Ketchum Police Department for nearly 28 years. The Sheriff’s Office reported in a news release that Kassner “has served his community as a patrol deputy, a field training officer and a patrol sergeant.” Kassner served as acting police chief for four months in 2009 before discussions between the city and the Sheriff’s Office led to the law enforcement contract. At that time, Steve Harkins, a detective with the Sheriff’s Office, was selected by former Sheriff Walt Femling as Ketchum police chief. Harkins was appointed by Ramsey as chief sheriff’s deputy in April and has served in both positions until Kassner’s appointment to the Ketchum job. Ramsey said Monday that nearly a dozen law enforcement officers applied for the job. He said five officers, including four internal and one external, were selected for interviews and that Kassner was chosen as the most qualified from that group. The Sheriff’s Office reported that with the promotion, Kassner’s annual salary increases from $70,782 to $75,961. The Sheriff’s Office reported that Kassner worked the swing shift Monday evening. He could not be reached for comment by Idaho Mountain Express press deadline on Tuesday. The Sheriff’s Office stated in the news release that Kassner achieved a career goal by being appointed police chief. He began work for the department in 1986 and completed the Idaho Peace Officer’s Standards and Training Academy course in 1987. He is a graduate of Washington High School in Two Rivers, Wis. The Sheriff’s Office reported that Kassner has continued his education and has completed numerous management courses, including executive development, command training through the FBI, risk management, and first line supervision. Kassner also completed a 12-week mental-health program with the National Alliance on Mental Illness. Furthermore, he has specialized in training on pedestrian and bicycle safety issues. 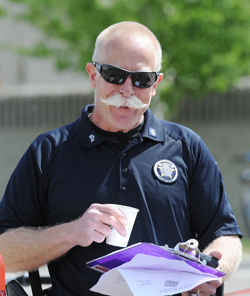 With the Ketchum Police Department, Kassner was evacuation plan coordinator for the Castle Rock and Beaver Creek wildfires, created the Mountain Bike Patrol for the city and has been responsible for implementing a bike safety program for the city of Ketchum and the Blaine County bike trail system.